Over the next five to seven years, Asia will likely add over a billion new users in one of the largest and fastest geographic expansions of internet access in history. Yet the region is unprepared for the attendant political and security risks of digitization. 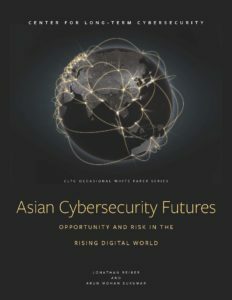 Asian Cybersecurity Futures explores diverse political, economic, and technological factors that will shape Asia’s future as the region becomes more connected. Authored by Jonathan Reiber, Visiting Scholar at CLTC and former Chief Strategy Officer for Cyber Policy in the Office of the U.S. Secretary of Defense, and Arun Mohan Sukumar, head of the Technology, Society, and Security Program at the Observer Research Foundation in New Delhi, the study focuses on how technological growth could place populations at risk in cyberspace, and explores the nexus of nationalism and cyberspace operations in one of the world’s most dynamic economic regions. At the heart of the report’s analysis are three scenarios, stories about the future that look at how socio-economic forces in Asia may interact. In “Hack the Farm,” a malware attack causes agricultural drones to overspray pesticides in India’s cotton belt, leading to the destruction of crops and triggering a political crisis. In “Escalation in the Pacific,” tensions flare up between China and Vietnam over resources in the South China Sea, triggering a series of cyberattacks with unintentionally lethal consequences. In “The Beijing Cyberconsensus,” China develops information technology infrastructures across Eurasia via the Belt and Road Initiative, allowing Beijing to influence cybersecurity norms throughout the region.